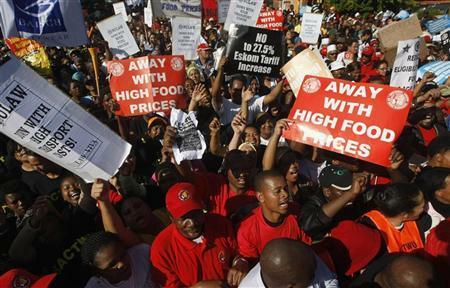 South Africa’s largest labour union group, with more than a million and a half members, said on Wednesday it would stage a nationwide strike on Feb. 13 over large-scale layoffs at ailing state-owned firms and at private companies. The decision by the Congress of South African Trade Unions (Cosatu) poses a major threat to President Cyril Ramaphosa’s plan to revive the economy by cutting the government’s wage bill and reforming state firms that are drowning in debt and plagued by corruption. The protests also come just months ahead of national elections, where Ramaphosa’s governing African National Congress (ANC) is likely to struggle to maintain its large electoral majority amid stubbornly high unemployment and rising poverty. “We’ve deadlocked with the government and private sector on the issue of having a moratorium on retrenchments, and in that situation we had no option but to apply for this strike,” said Pamla.